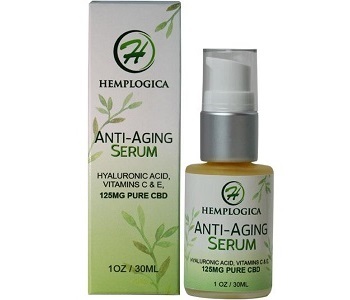 Welcome to our review of Hyaluronic Acid & Cbd Anti-aging Serum as made by Hemplogica. The formula pivots around the hydration contained therein which the manufacturer says penetrates deeply and binds moisture. The serum is also designed to retain collagen and is purportedly packed with omega-3 so you get the anti-inflammatory benefits of these fatty acids. Skin tone and elasticity are also improved across multiple layers, says the manufacturer. Vitamin C and Vitamin E are vital ingredients as they defend the skin against free-radicals and stimulate collagen production. In a serum, you particularly want vitamin C but the best products, we find, include it in a patented format to keep it stable, so you get much more of its powerful, restorative properties than you otherwise would. Pure Hyaluronic Acid is another winner. It should either be included on its own or via ingredients that would stimulate its production. It delivers superior moisturization that is indeed retained. Full Spectrum CBD is hemp oil. It is a natural anti-inflammatory so would particularly help if you have acne-prone skin. However, it is not a core clinically proven ingredient that we would consider mandatory. We would favor powerful algae antioxidants, given the weight of research behind it. D-Limonene is found in citrus fruit peels. It is commonly used as an astringent and antioxidant as well. In finding the best ingredients for your skin, it is best to look for ingredients that have been proven to work clinically and without any doubt, and with the weight of in-depth trials and research to back this up. Many of these ingredients are missing. They include but are not limited to wheat extracts, Alpenrose, and Electric Daisy Flower. No directions seem to be expressly provided by the manufacturer, which is a pity as this could affect the ability of a serum to work optimally. The usual procedure is to place a small amount of serum onto clean, dry and toned facial skin. We would have liked to know if it is lightweight enough for you to wear makeup over it. Hopefully, this is the case as that is the modern standard for serums. Still, it would have been helpful to know if this is indeed a lightweight serum that sinks into your skin quickly. A 125 ml bottle costs $49.99 should you want to purchase it from the product online store. There is a 15% discount if you sign up for a subscription. As a consumer, you should always do your due diligence with auto-send options as auto-ships are notoriously difficult to cancel in most cases. The products come with a 60-day money back guarantee and return policy. This is on a par with leading cosmetic houses who offer anything from 60-day to 365-day returns to back their products. The return postage though is for your own cost. There are no real reviews available for this product so although we would have liked some indication of how it is working for consumers in practice, this is not possible. The product incorporates natural ingredients, which is always preferable versus synthetic ones. There is also a decent emphasis on hydration and for the most part, the ingredient moisture mix is spot-on. However, the key ingredient is unconventional and it remains to be seen research-wise how much benefit it delivers compares to other ingredients that have been clinically vetted. The problem here is that quite a few of these vetted and proven ingredients are not included, such as Alpenrose and Willow Herb Flower. There also appear to be no patented ingredients, so the Vitamin C and E, for example, are not being delivered to the cells with as many properties intact compared to leading cosmetic houses which include patented forms of Vitamin C. It does not appear, given the ingredients excluded, that skin will get the full spectrum of nutritional properties required to remain firm looking and wrinkle sparse.